Contrary to popular assertions, Grace Mugabe was not the undoing of her husband, Robert. He was his own undoing. From time immemorial, the tendency has been to blame women for the fall of great men. For instance, it is widely highlighted by the Christian faithful that Eve tempted Adam to eat of the fruit of life. Less emphasized is the fact that Adam could have said 'no thank you'. A further instance is the vilification of Delilah for bringing about the capture of Sampson. Little mention is made of the fact that Sampson kept going back to her after she twice tied him up and called the Philistines. 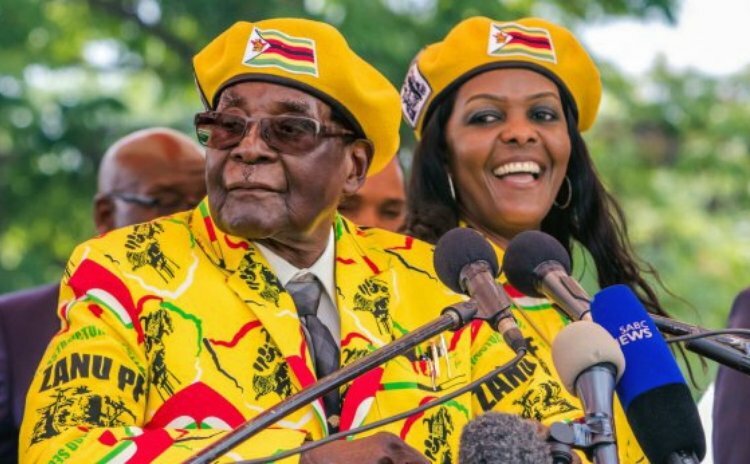 In the case of the Mugabes, there has been no end to popular indignation that Grace married a man that was forty-one years her senior. The implication of course, was that she was exploiting his old age and maximizing her younger attributes. But what woman can honestly claim that at twenty-seven, she would have been able to resist the advances of an older, eloquent, Gucci-bag -offering, very much vaunted freedom-fighting-liberator who, every day, stopped by her typewriter to say hello? Of more damning significance is that Robert Mugabe lured into a relationship, a woman young enough to be his granddaughter. The adage 'you make your bed, you lie in it' came to pass. From many accounts, Grace has been held as the person responsible for the ruin of the lives of many Zimbabweans. But when Grace and Bob married, he had already begun his descent into despotism and economic mismanagement. He was described by South African icon, Bishop Desmond Tutu, as 'a cartoon of the archetypal African dictator'. Who is responsible to the electorate? The elected! That was Robert, not Grace Mugabe. Who should ensure that members of the presidential family do not make profits from the country's diamond mines? The President, Robert Mugabe! He should have ensured that Grace did not use her position as his wife to unfairly seize, and convert to her own use, the property of others in violation of the rule of law. He should have stopped her conspicuous consumption, particularly in the face of 'the catastrophic poverty that was blighting the people of Zimbabwe'. But Mugabe could not hold her to a standard that he himself did not uphold. Grace Mugabe did not introduce extravagance to the Zimbabwean political elite, she simply got on a train that was already in motion. It makes little sense that a typist, who spent four years studying the Chinese language and at the end of the four years was still not proficient, could have naturally aspired to be the president of any country. That ambition would have had to be continuously stoked by something. Or someone. That someone was Robert, acting in his own self-interest. For him, it made perfect sense, that if Grace Mugabe became President of Zimbabwe, he would not be prosecuted for his many violations of the law, including the use of violence and murder to quell and stifle opposition. To make sure that she was an academically qualified presidential candidate, he, in his capacity as Chancellor of the University of Zimbabwe, awarded her a doctoral degree in Sociology two months after she entered the program. Whose action was that? The silly young woman may have wanted it, but the powerful, though desperate, man delivered it. Profligacy and thievery aside, Grace's foray into politics was curiously met by Western onlookers with scornful assertions that she was "very ambitious". Maybe. But, while she is pilloried for ambition beyond her experience and knowledge, other first ladies of color of immense capability were encouraged not to appear in the political limelight or to seek an influential role. One such example is Michelle Obama who, in her own right, is a brilliant, Princeton and Harvard-educated lawyer and was Barack Obama's supervisor at a leading law-firm. However, when white wives of other presidents pursue office, it is cheered, and presented as irrevocably shattering the glass ceiling that limits the political life of women. There is no question that Grace Mugabe ran amok in Zimbabwe and abroad. But she could have only done so with the tacit consent of her husband. It was his duty as the elected official – the President- to ensure that he and the members of his family were unimpeachable. And it was his neglect of that duty that spawned a corrupt and uncouth first lady. We should avoid continuing the mind-set that has ensnared mankind for time immemorial and that has made women the villains, and men their unsuspecting dupes. Blame, for sure, rests at Grace's Ferragamo'd heels, but it more rightly and squarely resides in Robert Mugabe's aging lap.